Today I am grateful that gardening allows me to be creative. My beloved grandfather was a talented and prolific artist and it has often bothered me throughout my life that I never cultivated the artist in me. I stopped drawing at some stage and today find it difficult to draw even a simple stick man (ok, that might be an exaggeration, but as I child I could draw and paint. Well. That is something I cannot do today). But in the garden I can pretend to be an artist! I can be creative and “design” garden beds, I pair different plants for effect, prune shrubs to shapes that appeal … often the results of my gardening creativity are questionable, but I’m learning to be creative in my garden and for that I am grateful. 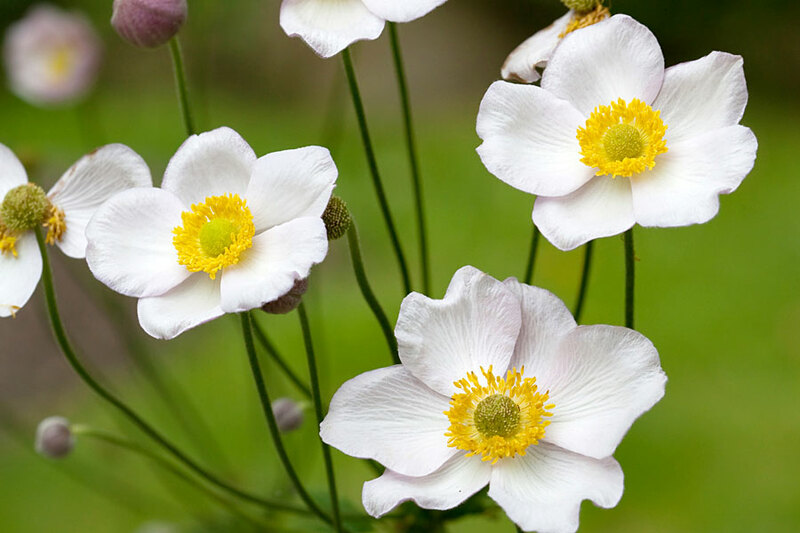 Photo: Japanese anemone ‘Honorine Jobert’. I simply love this easy-to-grow plant which rewards me in my shaded garden with a wonderful display of these gorgeous white blooms dancing high above the plants foliage in late summer to early autumn. 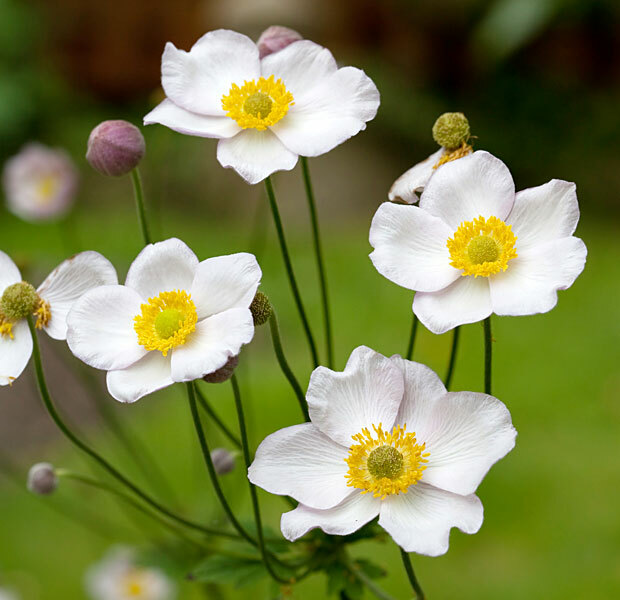 ‘Honorine Jobert’ is a vigorous, fibrous-rooted, mounding, compact Japanese anemone hybrid cultivar which typically grows to 3-4′ tall and spreads by creeping rhizomes. Single flowers (2-3″ diameter) with 6-9 overlapping white petaloid sepals and yellow center stamens appear on long, wiry-but-graceful, branching stems over an attractive foliage mound of trifoliate dark green leaves. I’ve been off line for a while and missed the start of this. What a great idea and of course you are an artist. All gardeners are! You are an artist my dear and this photo proves it…lovely pic of one of my fav flowers…my inner poet was silenced for 40 years and has reawakened…don’t sell yourself short…I believe you can cultivate that artist again…it is waiting for you to release it!! no Donna, I’m really not, not with a camera at least. One day I will actually do a course and then perhaps, but now the good shots you see are pure luck, honestly! Your photos are your art! I am sure your garden has splendid artistry as well. Their is creativity and artistry in all of us, it is just over coming the negative thought that one doesn’t. Sorry if I can not keep up on the daily postings, all my favorites are participating in the daily postings meme. I wish Donna! I get lucky occasionally only because I take so many – and once in a while there is a good one. These flowers are gorgeous! My grandfather was also an artist. The creativity gene was passed down but not the painting gene! Gardening allows for creativity in so many ways. I’ve found blogging does too. I’ve been pleasantly surprised by this. Especially by how much I’ve liked learning more about photography. At times though I still wish I could paint the way the camera captures something in my garden. I agree Cat. It must be incredibly rewarding to be able to draw or paint what you see. A garden is like a painting you’ll never finish! You’ll keep changing things (some by choice, some because of a plant death) and refining, enjoying all the while. That’s a gorgeous photo, Christine. I had some similar thoughts. I wish I am talented in water color painting. Since I am not, I sometimes look at some of my photos as if they are paintings. In fact I have some of these words in a dragonfly photo that I was about to post. One, you are an artist!!! your photos are outstanding, photography is your art!!! I am always in awe of your photos. If I could take photos the way you do, I’d call myself a Photographer. when I show a reasonable photo on my blog, just know there are at least 200 that got deleted because they are pathetic! I get lucky occasionally, you have SKILLS!